Perhaps the most dreaded scourge of the digital artist is data loss. Unless you manage to regularly maintain a strict backup schedule to keep copies of all your digital work files in separate places (and let's be honest - that's right up there with flossing every day and jogging 4 times a week) you have probably encountered the problem before. But what happens when you diligently back up your work, only to have the storage medium you used go out of style? Imagine being a filmmaker who has copies of all their work on BetaMax tapes. Well, the same thing apparently happened to works by pioneering pop art icon Andy Warhol. 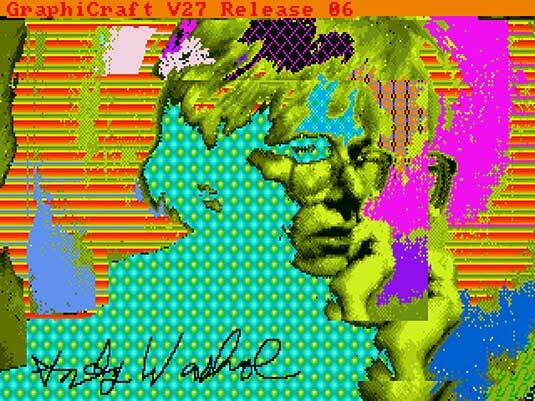 Originally commissioned in 1985 by then-thriving computer company Commodore to create a series of works using their computer graphics software, Warhol produced a number of images using a now-hilariously antiquated program named GraphiCraft, which was never the less the pinnacle of computer graphics technology at the time. Out of the whole series he created, only one piece was ever used in a real-world setting, a picture of artist Debbie Harry. All the rest of the images were saved to floppy disks, and left to gather dust and be forgotten in some back corner of Warhol's studio. After the artist's death, however, the disks were part of a collection that was donated to The Warhol, a museum in Pittsburgh dedicated to all things Andy Warhol, part of the Carnegie Museums collection. However, by this time, Commodore was going bankrupt, and the museum had little technical knowledge that would have allowed them to access the content of the disks - and, not knowing was contained on them, they had little incentive to find out. Fast forward to 2014, when Cory Arcangel saw a Youtube video of Warhol promoting the Amiga 1000, which inspired him to reach out to the museum to find out what happened to his experiments with the first computer graphics systems. The result was a collaboration between The Warhol's chief archivist, Matt Wrbican, and a group of computer enthusiasts from Carnegie Mellon University, the CMU Computer Club. Thanks to the expertise of the CMU Computer Club, the images were able to be recovered after painstaking tests and careful problem solving. For those of you who've read our recent post on drawing tablets, you'll be easily able to see how even the most capable artists would have struggled to adapt to the mouse interface that was standard issue on most computer systems at the time! This past week seems to have had a flurry of Andy Warhol-related products come to market, to celebrate his pop art flair, and to acknowledge the way that his work has enshrined certain brands in the public eye. Earlier this week we saw the limited edition set of Campbell's soup cans, which have gone on sale at Target for a very modest 75 cents a can. They pay homage to the soup can series that Warhol created in the 1960's, making Campbells an icon of post-war American consumerism. 1.2 million tomato soup cans have been created with these limited edition labels. 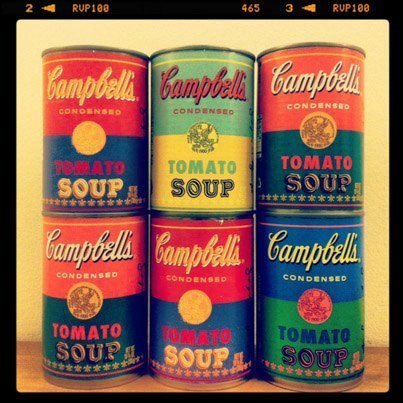 Campbells purchased one of Warhols soup can paintings in 1993 for their boardroom, and since then has worked with the Warhol Estate and Foundation in regard to rights to create clothing, magnets and other memorabilia, featuring the artists renditions of their products. Perhaps the other most famous commercial product that Warhol chose to recreate in the 1960's was the Brillo Soap Pad boxes, which he mimicked as art in 1964. 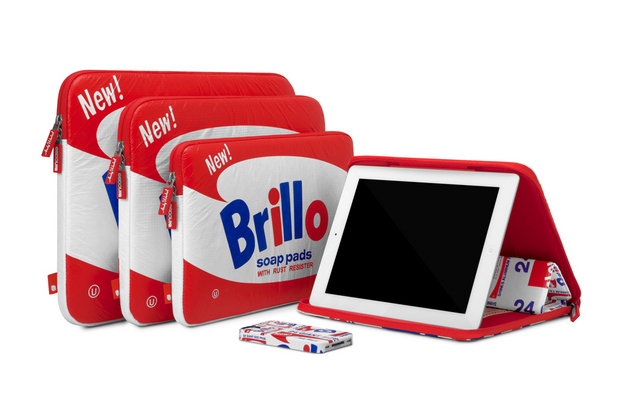 It will be Brillo's 100th anniversary in 2013, so they have teamed up with Incase and the Andy Warhol Foundation to make a collection of laptop sleeves, iPad covers and iPhone cases featuring the famous Brillo packaging. Those will be a little dearer to purchase, with prices likely to be between $40 - $100.